I’ve just spent a fascinating few days at the Summit on Customer Engagement in Burlingame, California, in the heart of Silicon Valley. The event covered the latest trends in customer marketing and was attended by a wide range of practitioners from mainly tech-focused organisations including ADP, Autodesk, Cohesity, HPE, FireEye, Marketo, Optum, Oracle, Red Hat, Splunk and Zuora. Here are four broad takeaways from the event for those responsible for customer reference and customer advocacy programs – or anyone interested in what’s going on in the increasingly important field of customer marketing. There is still plenty of life in the traditional written case study describing how a customer used a product or service to solve a business challenge. As Vinay Bhagat, founder of review platform TrustRadius said, customers are sceptical of marketing collateral. Instead, they want to hear from other customers and understand their experiences. The twist is that firms are now slicing and dicing each customer story into multiple formats, then distributing those vignettes through more and more channels. Those formats include PDFs, videos, social media posts, blogs, slides and infographics. The channels include everything from hard-copy handouts to websites, social media networks, live events and the media. Practitioners at the event focused especially on the new requirements that arise with video and social media. One business said it produced 1.5-minute master customer videos then cut them down to one-minute, 30-second and 15-second versions. It even produced social media teasers of eight seconds max. The only rules are budget and that the customer is happy to be so widely dissected and distributed. You can also read more advice from us about case studies here. If there was one overriding message from the event, it was that marketing directly involving customers – or ‘customer marketing’ – is on the rise. Just check out how many hits you get if you search ‘customer marketing jobs’, or read this great post from Influitive about related roles. This new field encompasses traditional customer reference programs aiming to identify customers willing to act as referees, then use them in case studies, to talk to other customers, as speakers at events and so on. Customer marketing also covers the burgeoning world of customer advocacy programs, which focus on finding or fostering customers who are happy to be advocates and partners for a business within company-managed communities or wider forums. This builds on a long-held idea in the high-tech industry, which is to support the growth of user groups – where people who use a product or service can meet to compare notes and give each other advice. With the advent of social networking, this user group concept has exploded and spread well beyond the technology industry. For example, the payroll processing giant ADP revealed that its ‘ADP Ambassador’ advocate community had grown to more than 4,500 members since 2015. Those members are typically payroll administrators who use the forum to connect with peers, as well as interact with the business, join webinars, complete surveys and provide testimonials. ADP’s Ambassadors also provide feedback on the company’s products – good and bad – which the company seeks to take on board. Welcoming and acting on feedback is vital to enabling organisations to achieve business success in general and become a ‘customer-powered enterprise’ – the Holy Grail of customer marketing. There is a range of specialised software tools and platforms to help you manage and expand customer marketing programs. These can be very helpful for keeping track of customer relationships and assets, and to automate processes. However, attendees also warned that as systems become more comprehensive and powerful, they also require more administration to keep them relevant and working well. As a result, you should only implement a system that’s ‘just enough’ for your needs. Keynote speaker Thomas Been, Chief Marketing Officer at TIBCO Software, also said it’s important not to abuse the power of the latest software tools. Specifically, brands should only use customer data for the purpose it was collected for, and should always focus on interacting with customers in valuable and non-invasive ways. With those caveats, here are some of the specialised tools that those attendees were using. Gainsight – software that spans the full customer success journey, including advocacy and reference programs. Influitive – a platform to create and grow customer advocacy programs, with engaging elements including gamification rewards. ReferenceEdge – an application for customer reference and request management that works natively in Salesforce. Upland RO Innovation – a hub to connect sales, marketing and customer advocacy systems. Another solution recommended by Thomas Been was Bizible from Marketo. This is a sales analytics tool that allows users to link their customer marketing activities to final sales to prove their value – and provide the vital return-on-investment metrics needed to secure next year’s budget! The real reason people go to conferences is to spend time with their tribes and to feel better about their professions. 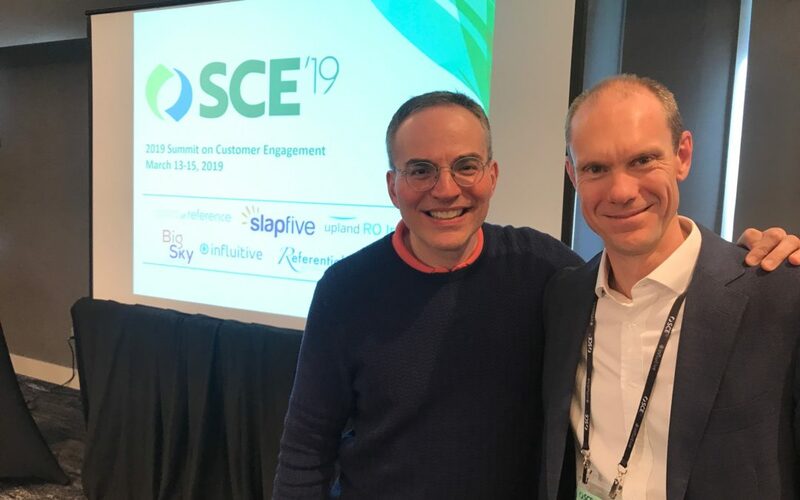 The Summit on Customer Engagement was no exception and featured a great session by the New York­–based writer and positioning consultant Mark Levy (pictured, left, with me). Levy asked the audience to come up with three ‘proud moments’ from their work as customer marketing professionals. The exercise was designed to help people better understand their roles and why they do them – and to be able to describe their jobs next time they met someone. The answers included everything from getting a personal sign-off from Oracle CEO Larry Ellison for an entry-level customer reference job, through to the joy of securing sign-off on a case study after two years of trying. Another person explained how she had grown up moving between military bases and found herself adept at learning about new environments and giving people directions. She now applied that same skillset to helping customers navigate her business, and salespeople to find their way around the company’s huge customer base and reference program. Let me leave you with that question. What are your three proudest moments as a professional, and what does that say about the benefits you deliver to yourself, your business and your customers? Hopefully this will help you at your next BBQ or at least your next job interview. Grant Butler is the founder and director of Editor Group. Keep fighting for the writing!